In this humorous video, personal care and hygiene product company Bodyform responds to Richard Neill, a man who recently vented on their Facebook page about his frustration with advertising myths surrounding periods. Bodyform states, “There are many stereotypes surrounding periods, when they are simply a fact of life that women experience every month. 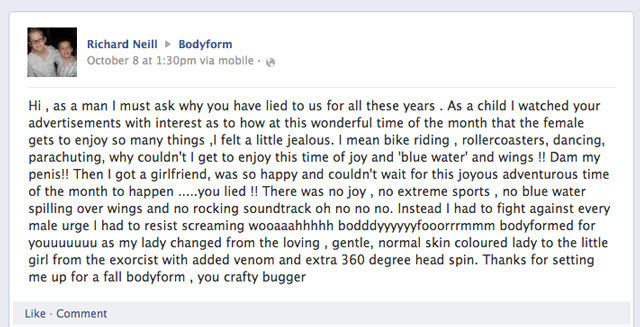 Bodyform has always championed women and the way they get on with their lives, juggling many tasks – whether they have their period or not…” While Bodyform does not have a CEO, they say if she did she would be named Caroline Williams, like the woman in the video.